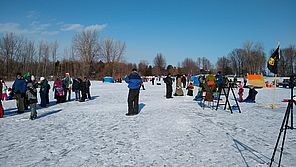 The Vermont ice fishing festival is hosted every year by the Fish and Wildlife Dept., and is free and open to the public. Photo by Laura Pratt. 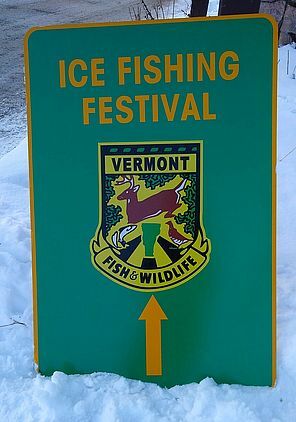 The Vermont Fish and Wildlife Department (VT F & W) hosts the free festival every year to introduce people to ice fishing. On the ice near the shore was a series of stations, each covering a different ice fishing topic. Festival-goers were encouraged to move from station to station to get their registration cards punched. 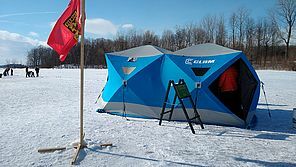 After visiting at least three stations, attendees could borrow ice fishing equipment, and try their luck out on the lake. The first, and perhaps most important station was about ice safety. Understanding ice safety is vital whenever you’re on ice, whether you’re fishing, skating, or just taking a walk. Ice needs to be at least four inches thick to support an adult’s weight, and more to support a car or snowmobile. You should also consider the type of ice you’re walking on – new, clear ice is actually stronger than old ice. White, cloudy ice is evidence of a freeze-thaw cycle, which means the ice could have less structural integrity, and might need to be thicker than four inches. 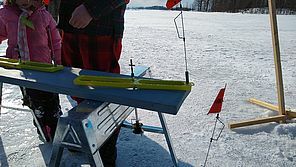 A good way to check the ice is with an ice testing pole – a long, heavy pole that comes to a point on one end. It’s used to jab the ice at an angle, as far from yourself as possible. This will keep you safe if the ice does begin to crack. It’s also important to remember that ice doesn’t always freeze uniformly, and there can be a thin spot of ice right next to a thicker ice shelf. Currents running under the ice make it fragile, and you should be especially careful near streams, bridges, culverts, and other narrow waterways. All stations included pop-up warming shelters, which are the modern version of a traditional wooden ice shanty. Photo by Laura Pratt. All the volunteers and staff at the ice safety station sported inflatable life vests and ice picks connected by a cord around their necks. Should they fall through they could easily unclip the ice picks and use them to drag themselves out of the water. “I never go on the ice without them,” said one volunteer. After the ice safety stop were several stations that taught different ice fishing techniques. One demonstrated knot-tying, while another had a collection of augers for drilling through the ice. A particularly crowded station demonstrated the use of a tip-up, equipment that can be set up over a hole in the ice. In the center is a reel of fishing line, much like that on a fishing pole. You set the depth you want the fishing line to go to, and then spring-load a flag to pop up if there’s a tug on the line. Fishing regulations typically limit the number of tip-ups used at a time, but they are a good way to cover more ground in the winter, when the fish are less active. A tip-up can be placed over a hole in the ice to more easily fish several holes at once. Photo by Laura Pratt. Ali Thomas, VT F & W Education Manager, spent her time at the festival rotating between the different stations. When asked about the event she said, “This is one of our largest events because it is a free fishing day throughout the state, which means you still have to follow regulations and rules, but you don’t need a fishing license to actually participate in fishing.” The State of Vermont has two free fishing days – the day of the ice fishing festival in January, and another day in mid-June. The State of New York also hosts free fishing days, which can be found on their Department of Environmental Conservation website. Ali has been ice fishing for at least five or six years. While she primarily does it for work, she also occasionally fishes in her free time – especially when she wants fish in the freezer. Where you go to fish depends on the species you’re looking for. On the Vermont side of the lake Ali recommends the South Bay area and Keeler’s Bay for pike, Knight Point for perch, and the mouth of the Winooski for a variety of fish. On the New York side you can find perch and bluegills in Bulwagga Bay, and larger salmon and lake trout near Port Henry or the Champlain Bridge. The easiest way to find up-to-date information on where the fish are biting, and where the ice is safe, is to visit your local bait and tackle shop. This also gives you the opportunity to buy or rent the equipment you need. 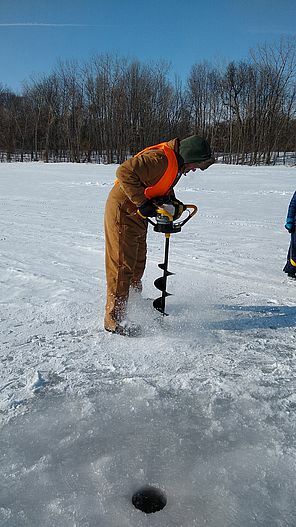 A man demonstrates using the power auger, which can quickly drill through thick ice. Photo by Laura Pratt. While free fishing days are a great time for beginners to get started, VT F & W also hosts free clinics on ice fishing basics and runs programs for schools through their “Let’s go fishing program”. Interested schools can reach out directly to the program. “Jigging” is a term used to describe the act of bobbing a baited line up and down in the water – and a jigging rod for use in ice fishing would need to be shorter and lighter than a typical summer fishing rod. Much of the tackle is the same for ice fishing as open water fishing, including basic hooks, line, sinkers, and lures. Live bait is recommended, particularly for beginners. Local bait and tackle shops are always a good source of fishing equipment rentals, as well as information about good fishing spots and safe ice in the area. The Vermont ice fishing festival drew large crowds, who enjoyed learning to ice fish on a beautiful, sunny Saturday. Photo by Laura Pratt. In addition to ice safety, it’s important to be ready for the weather. Dress in layers, and choose clothing that will keep you warm when wet, like wool or fleece. Bring a good winter jacket, waterproof snow pants, and warm boots. Keep your layers loose to trap warm air. Bring a compass in case of white-out conditions, so you can find your way off the ice. Make sure you tell someone where you are fishing, what access point you are using, and when you expect to be back. For more ice fishing basics and safety tips, visit the Fish and Wildlife Dept. website. “Never hesitate to call the Fish and Wildlife Department if you’re a beginner and you’re not quite sure how to start’” says Ali. “We’ll point you to one of our clinics, and we provide all the equipment, it’s free, it’s all over the state. It’s a great way for beginners to get a little experience under their belt.” Ice fishing on Lake Champlain can be a perfect way to spend a beautiful winter’s day. But don’t delay, spring is right around the corner and all ice shanties need to be off the ice before it becomes unsafe or by the last Sunday in March (March 31 this year), whichever comes first.